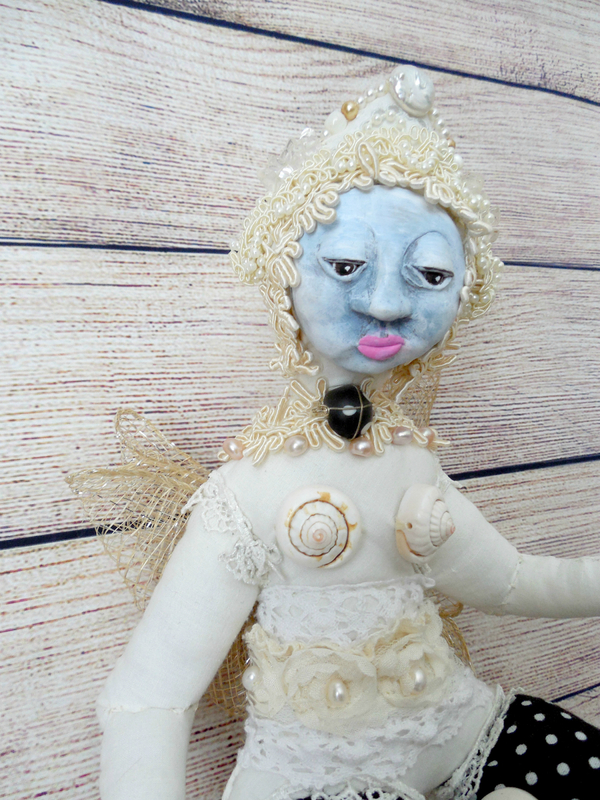 Amaryllis is a layered White Butterfly Woman Beaded Art Doll that is accompanied by a Shabby Chic style Birdcage. She was created in support of Women's Empowerment. 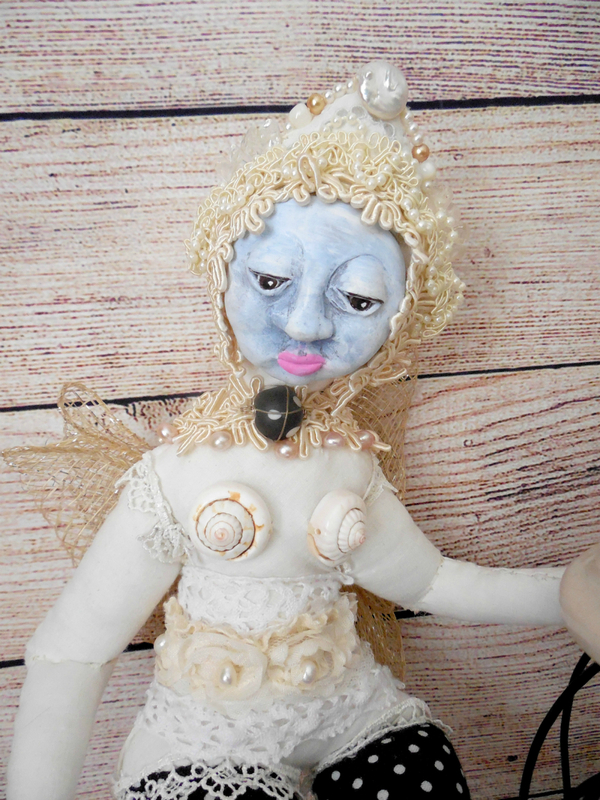 Amaryllis is an OOAK spirit doll, entirely hand stitched and beaded, artfully crafted of Cloth and Clay with mixed media embellishments. She can be displayed in various ways. She can sit inside the Birdcage in different positions, and the birdcage can either hang from the ceiling, or it can sit on a table of shelf. She can also be seated outside the birdcage, leaning up against it. A printed Story Card comes with her which also serves as her Certificate of Authenticity. Dear little Amaryllis ~ You have blossomed into an exquisite butterfly. You traveled far on your journey to arrive here, to this very special place of anticipation. It is time to Fly, to stretch your wings to their fullest, and Fly. The boundaries that you once knew, exist no longer. All the growing pains that you experienced helped to create the beautiful Being that you are now. It's a big world out there and there is a special place for you in it. You mustn't think in terms of limitations, but in terms of liberation. Your soul knows no bounds, so allow it to lead. Spread those wings of Knowledge and glide into your new world of Opportunity. Amaryllis is approximately 22 inches in height. 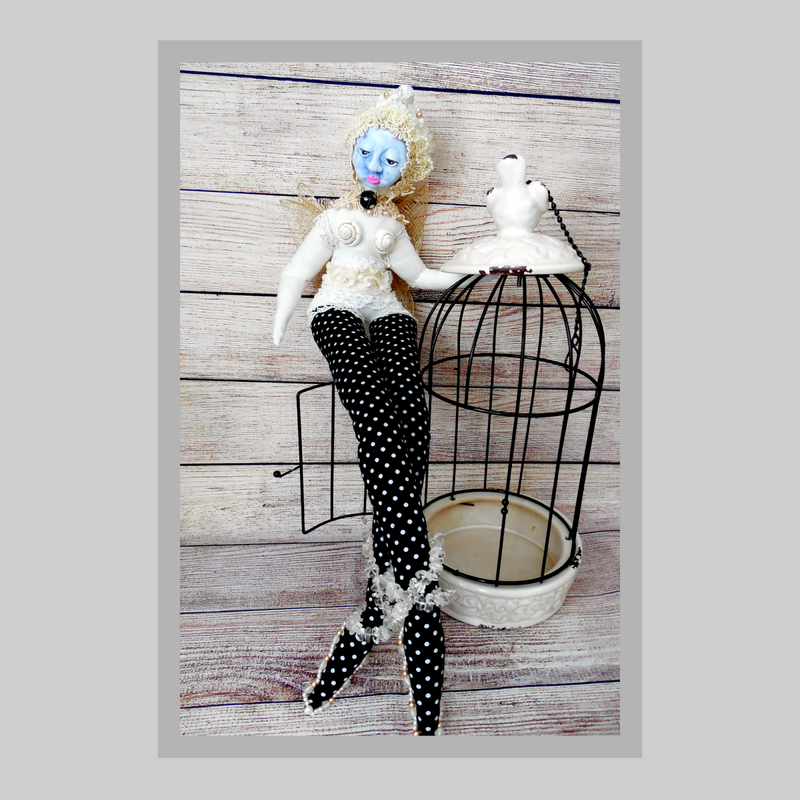 Her body was hand stiched, her torso and head sewn from a vintage white hankerchief, and her legs sewn from a black and white polka dot fabric. Her head was designed like a crown itself, with Pearl beading and ivory lace trims that give her a rich jeweled appearance. Her face is an Original Sculpt of doll making Clay, later painted with Acrylics. 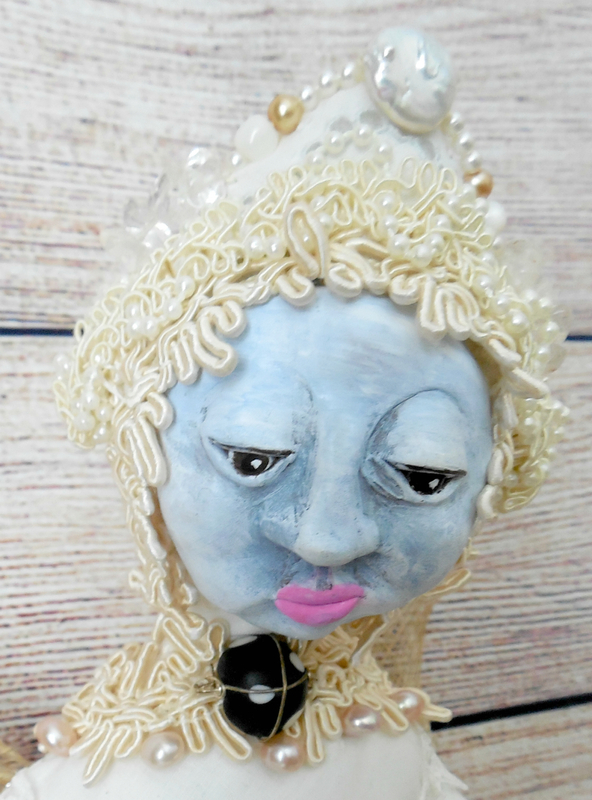 She has a soft periwinkle blue sheen to her face and her lips are a soft pink. A soft gold textured ribbon creates her bow-like Wings that are sewn to her shoulder blades. Ivory trim with pale pink pearls adorn her neck and shoulders, accented with a black and white polka dot focal bead. She has two ivory spiral Shells as breasts. Her waist is embellished with layers of various Lace trims, and accented with a row of white pearl beads. Her feet have beaded "sandals", designed with Clear Quartz and Pearls. The Birdcage was a "found" object, and is designed as a Shabby Chic piece. The top and bottom of the birdcage are an off-shite porcelain. A bird is molded into the top of the birdcage, and a black chain hanger emerges from the top. The birdcage measures 14 inches in height, and 6 inches in diameter. 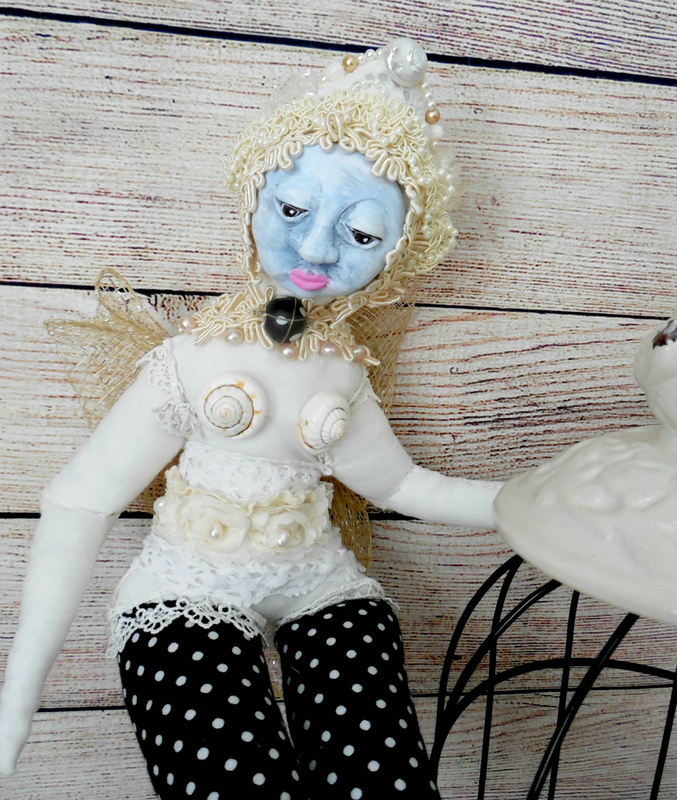 Amaryllis is a richly detailed OOAK (Original One of a Kind) Art Doll. 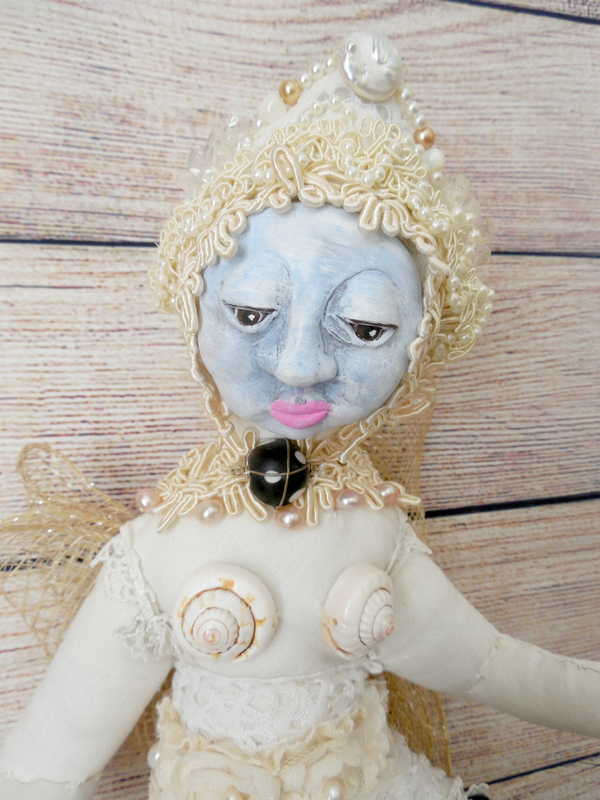 She is a part of my Wisdom Keeper Art Doll Collection, created for adult collectors, and Not as a children's toy or decor because of the small components. She is accompanied with a Certificate of Authenticity. Thank you for visiitng my online gallery.